March was an exciting and busy month for the Simpleview team. Take a look at what&apos;s new and intriguing below! Monterey now has a redesigned website with the new CMS! Creative Director Lisa Love had the pleasure of visiting Monterey to soak in the destination and spend time with the MCCVB team in late October. 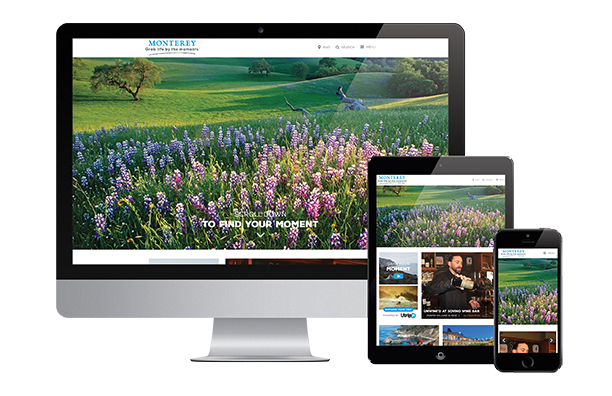 The result is a website that reflects the natural beauty and diversity of Monterey, showcased with many of the snazzy new features available in the new CMS. The Monterey team launched their site with an excellent PR push to help spread the word. Header Videos: Built into the header of the Home and Meetings pages, the header videos provide a visually engaging introduction to both the website and the destination. Collection Grid: The Collection Grid allows users to pull in numerous collection templates to engage site visitors via video callouts, featured sliders, image boxes and more. Highlights Slider: The Highlights Slider easily allows users to use large, impactful imagery and associated text to create unique and effective windows to other content within your website. Interactive Map: Site visitors can click on any region within the interactive map or region list to see an overview of the region and an associated image. From there, visitors can easily click through to the region content page to learn even more about the destination. Dynamic Content Module and A/B Testing Module: The MCCVB is quickly learning how to leverage these modules on their site to optimize content and improve conversion optimization. 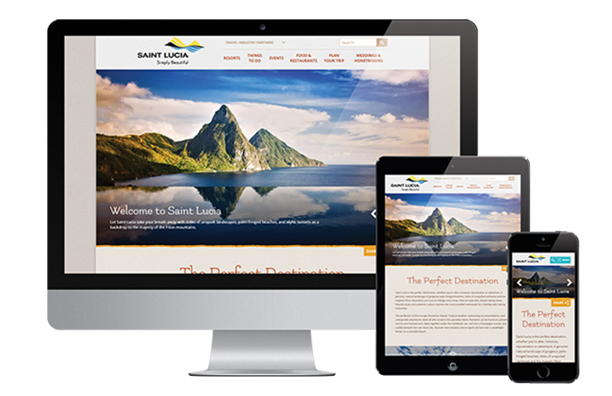 The beautiful island of Saint Lucia now has a stunning new website to match! Simpleview was truly grateful to have the pleasure of visiting this truly unique destination and experience the people, culture, and topography first hand. There was so much to see and do, Simpleview&apos;s creative team only barely scratched the surface. There are activities and adventures for every taste: spas, horseback riding, surfing, scuba diving, mountain climbing, volcanoes, mineral baths... the list truly goes on and on. Saint Lucia also doubles as a retreat for the rich and famous, equipped with a hotel and accompanying helicopter pad where guests can hop off and walk directly to their sanctuary. During a site inspection at yet another hotel, the team even ran into comedian and actor Russell Brand. Fun Feature: "My Saint Lucia" is a powerful tool located on Saint Lucia&apos;s new website that allows a visitor to choose their adventure personality and receive personalized experience suggestions based on the profile. Inspiring Detail: Highlight boxes feature alluring photography for topics including "Weddings & Honeymoons" and more. When a visitor hovers over these images, an aesthetic overlay slides down, providing a short description and a button to welcome visitors further into the site. The new Visitbgky.com was designed in-house by Eva Orduno and built using the new Simpleview CMS, with responsive design. When learning about Bowling Green, the Simpleview team quickly discovered that the destination is much more than fast cars. The third largest city in Kentucky, Bowling Green boasts a thriving university town with a progressive population and is also a dining and shopping mecca for a dozen surrounding areas. Below are just some of the web features that the Simpleview team built for the Bowling Green website. Fun Feature: "Which Generation Are You?" is a car-era themed itinerary widget easily located on the website homepage. With cars being a tremendous tourism draw for Kentucky (Corvettes are ONLY made there), this new feature translates this interest by asking visitors to compare themselves to classic cars and builds itineraries off of their selection (and maybe a few punny references in the text, to boot). Sometimes it&apos;s the little details that drive us at Simpleview! Inspiring Detail: Feast Your Eyes! The client was as revved up as we were about the site redesign, gearing up for a gorgeous new look with fresh photography options. Our creative team worked with them to use eye-catching imagery on the event listings pages, turning the details into far more than simple lists. Check it out here. There&apos;s quite a bit happening in Columbus. With nationally acclaimed distilleries and a thriving nightlife, Columbus offers a vast amount of opportunity to have a good time. Add in the recent expansions of downtown parkland and a new wing of the Columbus Museum of Art, and you have more to do than ever before in this bustling destination! 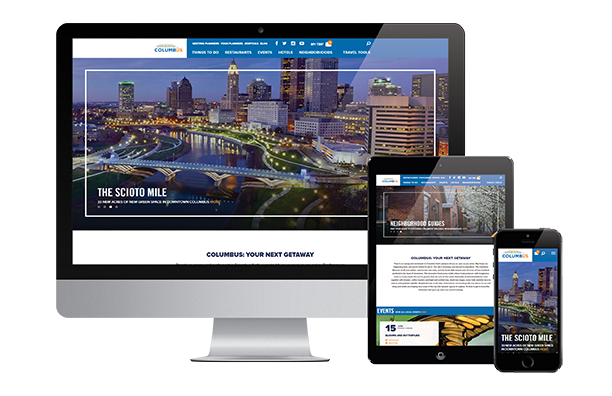 The Simpleview redesign of ExperienceColumbus.com was created with the new CMS platform, allowing for expanded creativity and functionality. Check out just some of the new features below. Fun Feature: "Made in CBus" is a custom addition to the listing widget to highlight local dining, event, and entertainment options in an aesthetic fashion. The listings even feature the option to add these activities to a custom itinerary. Inspiring Detail: Blog Like a Boss! ExperienceColumbus.com takes blogging to a whole new level, pulling visitors to the content right from the homepage feature, using modules for both leisure and industry, and incorporates the visual, full-width widget throughout the site to pull blog content into related sections, like this one. As a well known tropical paradise, Hawaii needs no introduction. Yet that being said, did you know that this destination offers so much more than natural attractions? The Hawaii Convention Center, for instance, boasts a massive 1.1-million-square-feet just a stroll away from Waikiki Beach. Hawaii truly offers a first class service to all visitors, and now its website is no exception. 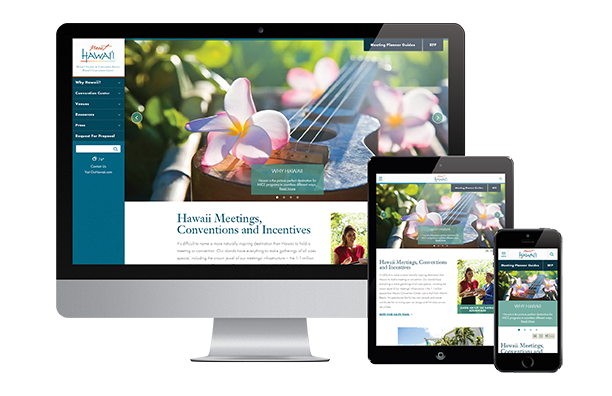 The new Meet Hawaii site keeps the look professional and the navigation pragmatic to best serve busy meeting and event planners. Fun Feature: How familiar are you with Hawaii&apos;s islands? "The Hawaiian Islands" interactive map is a responsive solution that helps you learn more and link directly to island content in an aesthetic, visual manner. Inspiring Detail: Keep it simple! Busy professionals like meeting planners want straightforward navigation and easily accessible information. Meet Hawaii&apos;s static left-side navigation addresses this need. Visitors can scroll the page, but the clean and organized keys to more content remain steady. 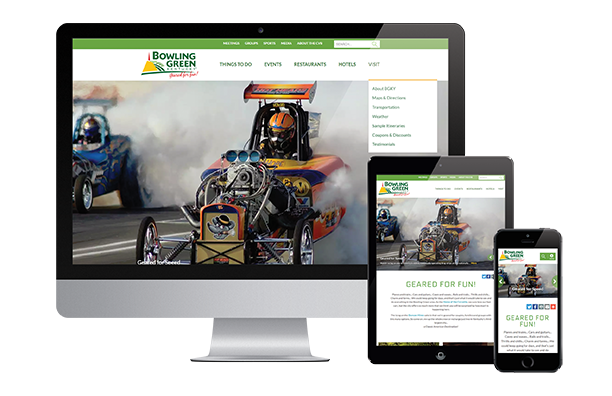 The folks at the Shreveport-Bossier in Louisiana launched two responsive websites. Their main site launched in January, with the events site, SB Fun Guide, launching later in March. Shreveport-Bossier is new to the Simpleview family and is a noticeably hip and distinctive destination. Shreveport brought in their local agency to create their design, and it was up to our team to do the building. Below are just a few of their new tools. Fun Feature: "Social Hub" This footer element allows the client to feature their Facebook and Instagram feeds, as well as spotlight videos from their YouTube page. Inspiring Detail: Show off! When a destination has so much to offer, it can be challenging to keep a lid on it all. 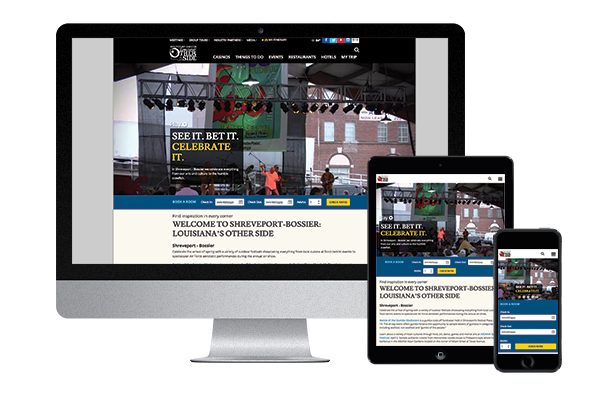 Thanks to the homepage Mega Widget, Shreveport utilizes a multi-tabbed interface to showcase numerous categories of attention-grabbing content (without burying too much quality under the fold). Inspiring Detail: Refine the focus. The goal for the SB Fun Guide was to give visitors a microsite that takes them straight to the fun and adventure they are capable of experiencing on their trip. This site is dedicated to all the events that come to the area, and many, many attractions. Nicknamed America&apos;s First Resort, Newport, Rhode Island has been luring visitors from near and far for over 375 years. With numerous historic mansions and a prominent, colonial-era port, history and luxury are both ripe for the picking at this unspoiled destination. 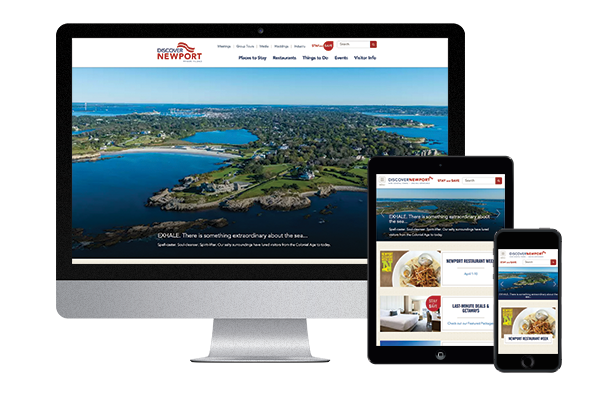 With its redesign, the completely refreshed DiscoverNewport.org moved to a new CRM and CMS. The new site is responsive and looks amazing across multiple devices, be it a phone, tablet, laptop, or desktop monitor. Fun Feature: Two key areas of the site, Newport&apos;s Top 10 Things to Do and the blog, From Stem to Stern, utilize an image box collection widget to tie powerful, eye-catching images to compelling content. Now that&apos;s how to grab attention and hold it! Inspiring Detail: Cleaned up data and updated images turned listings into a true showpiece across the site.